If you like to crochet, you will love making these beautiful barefoot sandals or flip flops for yourself, family, or friends. Great for the beach, summer concerts, bridesmaid gifts, or relaxing in your own backyard, these simple patterns use basic stitches and will only take a few hours. Click on either pattern thumbnail below to download and print the instructions. The Guide for Adobe Printables will help you troubleshoot if you encounter problems. The stitches on the straps of these sandals are single crochet stitches worked around the straps. This softens the appearance of the flip flops while eliminating the rub most often present with the plastic straps. These barefoot sandals are simple, elegant, and one-size-fits-most. You will want a pair to match all of your summer outfits. Neither of these sandal patterns has to be created exactly as the instructions state. If you are looking to customize them to suit your personal preference, consider the following suggestions and tips. While the pattern was worked using the same color yarn for both the straps and stars, contrasting colors can also be used. Buttons, charms, or sequins can easily be substituted as the embellishments on the stars. Replace the crocheted stars with small crocheted or silk flowers. Acrylic yarn, crochet threads and thicker or thinner yarns can be used. Minor changes to the number of chains may be needed for the toe loop. If using thicker or thinner yarn, change to a larger or smaller hook. Note: The completed heart shape may be slightly smaller or larger than the original but should not effect the integrity of the sandals. Omit the pony beads or substitute with other beads that have holes large enough to thread over the toe loops or ties. Stitch additional beads to each heart for more bling. 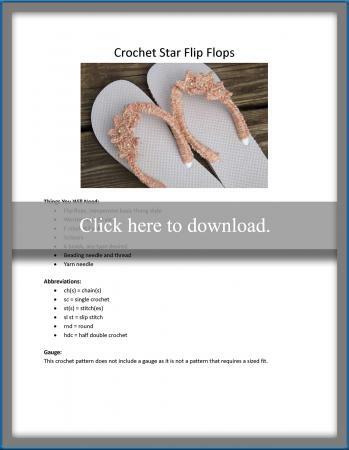 Both of these sandal patterns are inexpensive projects. The budget-minded fashionista or craft show vendor will find them very friendly to the pocketbook. Dollar store flip flops, small amounts of yarn, and beads you already have in your supplies will keep the price of your sandals down while elevating your savings and profits.